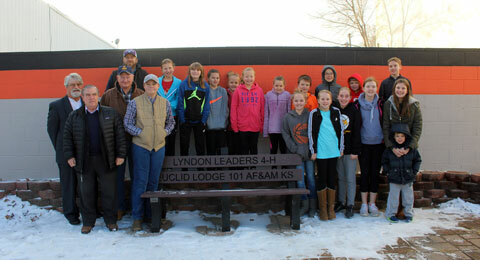 Euclid Lodge 101 and Lyndon Leaders 4-H Club members welcome all to sit and enjoy the new bench on Lyndon’s main street. Courtesy photo. A couple years after establishing their club, the Lyndon Leaders 4-H Club wanted to help their community in a big way. They set out to improve an area of Lyndon, and were able to secure an empty lot, near the corner of Sixth and Topeka Avenue. Improvements began in the summer of 2016, which included trimming overgrown bushes. They could see the project was going to require a lot more time, materials, and work, so they recruited help from a local Catholic Youth Missions Program, in the summer of 2017, to work alongside the club. The site dramatically changed in the matter of weeks, as they tore out existing grass, installed pavers donated by Lyndon State Bank and Doug Shoup, dirt donated by Wildcat Feeds, landscape rock for the flowerbeds donated by T-Bones Trucking, and a fresh coat of paint to match the restored Phillips 66 stripes across the street. The next phase of the venture included filling the flowerbeds with plants and a bench for people to come sit and enjoy. To club members’ surprise, they were contacted by the Euclid Lodge 101, of Lyndon, as they asked how they could help contribute. The Masons agreed to donate the bench, which was installed in Dec. 31, 2018. Club members were thrilled with the lodge members’ willingness to help, along with all the other people who gave their time and donations to make the project a reality. The club hopes to install new landscaping to complete the endeavor this spring. Club members are excited for accommodating weather so they can finally see the completion of their mission, which started from a small goal almost three years ago. Thank you: The Lyndon Leaders 4-H Club would like to sincerely thank everyone, again, who helped make the project possible, and they hope it will be an enjoyable new place for all passersby.